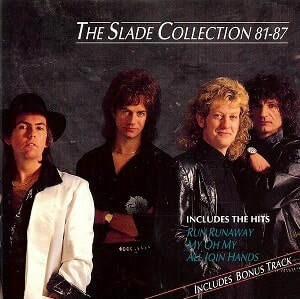 The Slade Collection 81-87 is a compilation album, released by RCA/BMG in March 1991. It contains seventeen tracks spanning the band's RCA years from 1981 to 1987, including three live tracks from Slade on Stage. A follow-up album, The Slade Collection Vol. 2, 79-87, was released in 1993. Hi-Fi News & Record Review commented: "OK, there are two or three numbers so corny that you'll reach for the sick bag, but other than that, this is fine pop." Stephen Thomas Erlewine of AllMusic wrote: "For casual fans wishing to supplement the storming, sleazy fun of Feel the Noize, The Slade Collection: '81-'87 contains all of the best latter-day tracks the group recorded, including "My Oh My" and "Run Runaway." Even in this condensed state, the material on '81-'87 isn't as compelling as it was between 1970 and 1975, but this compilation is certainly the best way to sample an inconsistent era."